This is a grouping of reproduction paperwork as carried by Officers in WW1. This comprises of an AB439 Officer's Record Of Services, a period Cox and Co. chequebook, an account book for the same, and the Officer's Advance Book for Pay. For better pictures and further information on the individual items please see my other pages for them (which can be purchased seperately if required, but there is a saving if purchased as a set). These are brand new copies supplied completely unfilled so that you can add your own details to improve your WW1 living history Officers impression. Each set of costs £60.00, plus postage and packaging. 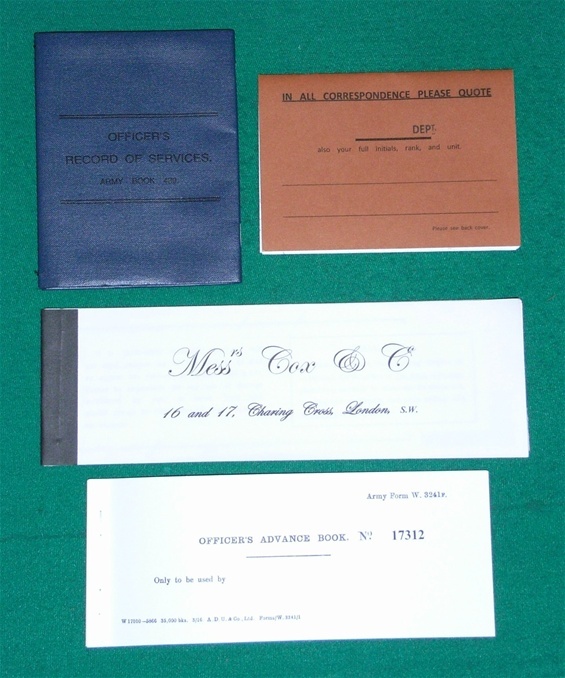 Reproduction AB439 top left, Cox & Co. account book top right, Cox & Co. cheque book at centre, Officer's Advance Book below.